- Service providers (carriers of wireless data, mobile application stores, Internet/mobile service providers, mobile testing service providers). - Equipment and software manufacturers (cell phones, mobile application stores, mobile operating systems, mobile game devices, etc.). - Mobile application developer and testing companies. Besides being able to utilize this IP by themselves, these target prospects can in turn provide other interest groups (e.g. application developers) with subscription-based access to this IP (CAIS product is developed to be offered as service from cloud in addition of possibility for stand-alone installation). We are open for different kind of engagement models, which could be e.g. patent sale (together with existing software source code) or other type of partnership. TSSN (Transmission Simulation Support Node) enables mobile operators, carriers and service providers to transform existing networks into economic engines while accelerating the exploitation of their current resources and creating new profitable mobile products at the same time. - Test and verify the operation of an entire core network from a single location. - Locate performance bottlenecks that restrict service delivery. - Perform load and capacity testing. - Connect to GPRS and UMTS services using workstation. - Provide application developers and testers with a configurable air interface simulation. - Generate charging data records (CDRs) from real data passing through the network to develop, test and tune various charging schemes. - Support the development of content charging. CAIS (Configurable Air Interface Simulator) is an original concept that offers a groundbreaking testing service for mobile applications. With this easy-to-use concept, companies and individuals alike are able to test run applications during the development process as well as analyze and verify the performance of their products in real-like environments with repeatable conditions. - Worldwide accessibility, enabling the creation of new customer relationships at a global scale. - Easy global access, one may connect to CAIS from all corners of the world. - Early testing and verification of applications without prototyping. - Simulation of entire mobile networks with configurable conditions to ensure the functionality of applications in real networks. - Remote configuration of simulation parameters. - Remote triggering of errors like cell changes, routing area changes and temporary capacity loss situations. - Highly scalable load and capacity testing. - Generation of charging data records (CDRs) from real data passing through the system to enable the testing, development and tuning of various charging schemes. 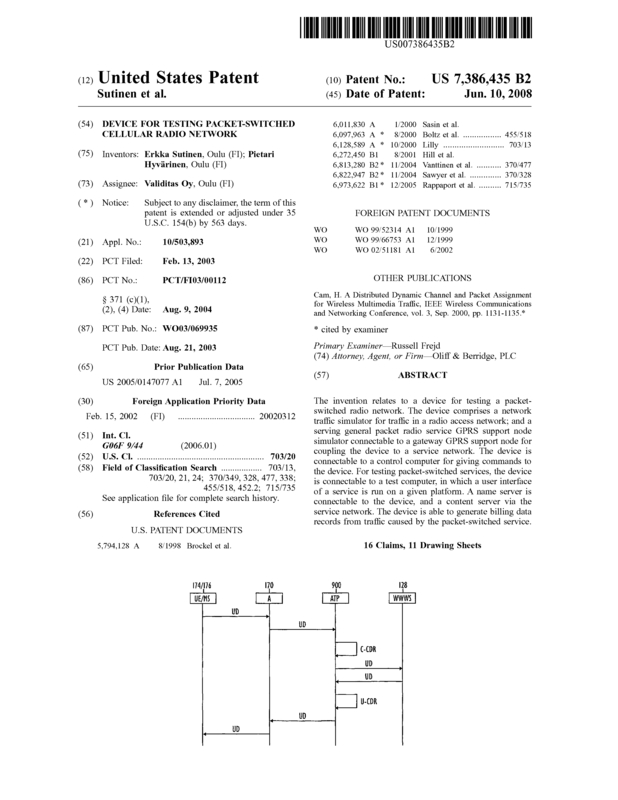 Page created at 2019-04-24 18:43:12, Patent Auction Time.